Volkswagen gave its classic microbus a face lift — for the second time. The German automaker unveiled a new microbus concept at the Detroit Auto Show on Monday. The electric bus is part of Volkswagen's goal to introduce 30 electric or hybrid vehicles by 2025, and to sell two to three million of them a year, in response to the Volkswagen emissions scandal. But this isn't the first time Volkswagen has given its beloved bus a high-tech twist — it first did so at the Consumer Electronics Show in 2016. Nothing could ever replace the retro bus, known as the Kombi, in our hearts. But it's worth looking at its evolution. Scroll down for a closer look. On March 8, 1950, the Volkswagen Microbus went into production. Formerly known as the Volkswagen Type 2, the bus would quickly become a symbol of America's counterculture movement, transporting self-proclaimed hippies all around the country in the 1960s. The bus was designed by Dutch businessman Ben Pon. It was such a symbol of the counterculture movement, that when legendary Grateful Dead guitarist Jerry Garcia died, Volkswagen ran an advertisement of the Microbus with a single teardrop. The tribute ran in Entertainment Weekly and Rolling Stone, according to Ad Age. 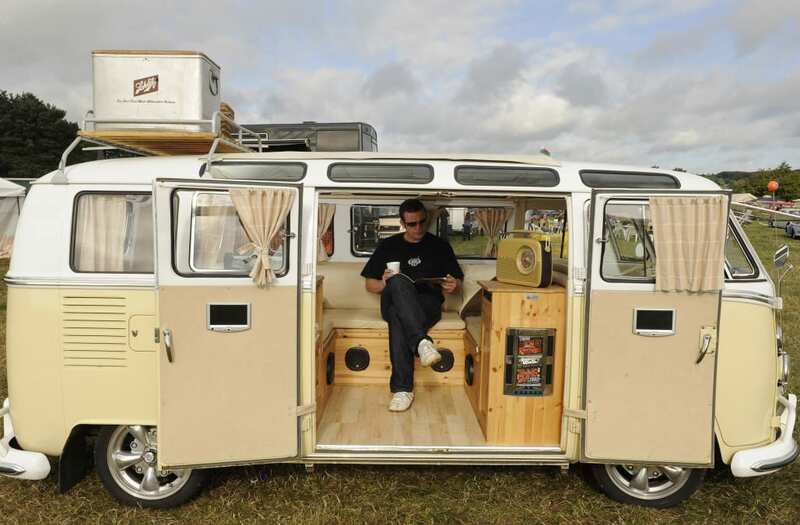 Deadheads primarily used the Volkswagen Westfalia Campers, the official camper conversion of the Volkswagen Type II. The campers, dubbed "westies," were often painted psychedelic colors. The designs were colorful, bright, and indicative of the flower-power generation. And you could easily convert the Microbus into a make-shift home, making cross-country travels to concerts or rallies very doable. It also offered plenty of space for when you were actually on the road. But the Microbus was discontinued in 2013 for not meeting modern safety requirements, like having airbags or anti-lock brakes. As Wired reported at the time, Volkswagen sold more than 1.5 million Microbuses, and it was the oldest oldest continuous production vehicle in the world. Then at CES 2016, Volkswagen unveiled a modern update to a beloved classic. Called the BUDD-E, the electric concept can get up to 373 miles on a single charge, Volkswagen claims. The doors open at the wave of a hand. The concept comes with an interface that can be controlled with hand gestures. It also offers connectivity to your smartphone — a far cry from the retro Westfalia! You can read more about the BUDD-E concept here. On Monday, Volkswagen unveiled another high-tech microbus concept, the I.D. Buzz. Also battery-powered, the concept can drive up to 270 miles on a single charge, Volkswagen claims. It also comes with self-driving tech like lidar, radar, and sensors. The new concept has a very clear interior featuring wood paneling. It comes with a single touchscreen console that can also be removed for use as a typical tablet. The concept's steering wheel can retract into the dashboard when the car is in self-driving mode. You can read more about the I.D. Buzz concept here. It's unlikely the BUDD-E or I.D. Buzz would garner the same appeal if they were to go into production. After all, the tech savvy mini buses are a far cry from the clunky, but homey, Type II. But it's something different from other electric vehicles out there and a cool spin on a piece of history.